EAST MARBOROUGH — With the Unionville Recreation Association High School Boys tourney drawing to a close, the excitement grows as each night comes. With just two nights of basketball left, don’t miss your opportunity to witness arguably the most well attended basketball event in the community. Join us Tuesday as 5 teams battle it out for the opportunity to make it to the final 3. Win or go home and to get there, you have to win twice on Tuesday. Games at 6:30, 7:30 and 8:30. Wednesday night at 6:30 is our Semi Final where the winner from Tuesday faces Piasecki/Willis. The winner of that game is guaranteed a coveted hoodie but has the unenviable task of trying to defeat the red hot Barnes/Burlotos team twice for the opportunity to wear the special edition, Championship Red hoodie versus the one designated for Finalists. The Championship game will tip off at 7:30PM. If necessary, Championship Game 2 will tip-off immediately following. Barnes/Burlotos 56, Piasecki/Willis 46 – With the invitation to the Championship game on the line, it was Tim Christopher who decided he didn’t want any Pie for dessert and he helped set the Championship dinner table for the Barnes/Burlotos squad. As the 3 seed knocked off the red hot Piasecki/Willis team, they are now sitting at the table awaiting someone to climb out of elimination purgatory to attempt to perform the unthinkable – defeat Barnes/Burlotos twice for the title. The game started out in typical “Chocolate Cream Pie” fashion with Eric Willis and Chris Piasecki running the floor and staking their team to a 12-9 first quarter lead. Faced with the difficulty presented by the Barnes/Burlotos infamous Twin Towers (Dan McClaskey and Stephen Lange) the Piasecki/Willis squad decided it was time to let the Big Rig out of the garage and get rumbling – and Zach Rigby did just that, fighting for every rebound, double and triple teamed and he still managed to score 19 points to keep his squad in the game. With Piasecki/Willis holding a 24-21 lead into the break, it was clear that whoever found that spark was going to take this game under their wing and will their team to the title game. Just then, Tim Christopher strolled out of the team huddle, approached the bleachers, and apparently got the spark he needed from his #1 fan, Demming Carlow. It isn’t clear what words of advice she provided, but Christopher erupted for 11 of his game high 24 points, chipped in 6 assists, 4 rebounds and 3 steals in the 3rd quarter alone! The Navy team followed his lead and when the 3rd quarter dust settled they had outscored Piasecki/Willis 24-11. The Big Rig tried to get his squad back in the game in the 4th, but Christopher matched him shot for shot and no one else could get on track as the Navy team rolled into the title game. Piasecki/Willis fall to the elimination bracket, needing to win one more game to get another shot at Barnes/Burlotos. Ladd/Langdon 60, Trout/DeMatteis 50 – The High school version of March Madness is generally something where the Seniors rise to the top and the underclassmen fall by the wayside and watch from the stands. When your team has but 1 Senior, it normally would spell trouble – unless you have a pair of Freshmen Phenoms and a Super Soph getting’ it done. The Super Soph, Andrew Nichols, set the tone early for the red team knocking down 10 points and covering more floor than wall to wall carpeting, torturing the DeMatteis/Trout squad with torrid defense and speed that would make Matt Olsen proud. When the 1st quarter buzzer sounded, the Nichols invoked frenzy had the Ladd/Langdon team out to a 20-5 lead. The second quarter was more of the same. In the middle of Alex Trout dislocating a finger and having it put back (Thanks to a lovely nurse in the bleachers), the red team continued their hot shooting with 17 more, riding out to a 37-14 lead at the half. This Fish wasn’t going to stay out of water for long as he put a bag of ice on it for about a minute and immediately inserted himself back in the game. With Fish obviously hobbled by his injury, the gray team struggled to get anything going until Hunter Conover got loose for 8 points in the 3rd. 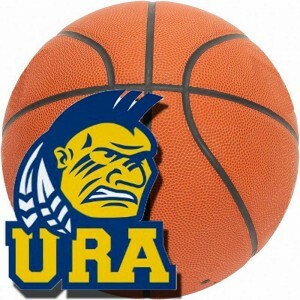 With Langdon/Ladd up 50-27 heading into the 4th, it appeared all but over until the Seniors remembered this could be their Last…URA…Game…EVER! With that Seniors Conover, Alec Jule and Mike DeMatteis erupted for 16 points and got their Baby, Andrew Uhrik, involved for another 8, but it just wasn’t enough. Freshmen Phenoms Spencer Kramer and Andrew Jones, Super Soph Andrew Nichols and Brian Ladd all had 12 points and Max “AK-47” Akoto added 9 points and 9 blocked shots for the winners. Piper/Holcomb 41, McWilliams/Matson 38 – This game was a battle of two surprises. The first surprise was that the 4 seed Piper/Holcomb squad was even in the predicament of being in the elimination bracket so early. The second surprise was the 10 seed Matson/McWilliams team and how they knocked off the 5 seed in the process to reach this matchup. With arguably the deepest team in the league, Piper/Holcomb is that tam you have been waiting to see catch fire and burn everyone in their path. They just haven’t had that one game where they are all on and that has been a blessing to the rest of the league. The nightmare for the rest of the league is that they are still alive. After jumping out to a 12-8 lead in the first, the Piper/Holcomb squad forgot how to score, held to just 3 points in the 2nd and 7 in the 3rd. The McWilliams/Matson team leaned on Steven Fatzinger (14 points), who continued his assault on the highlight reels with 360 moves, and ball fakes that could break an ankle. Heading into the 4th quarter down 7, it appeared Piper/Holcomb was next on the upset list for the upstart Matson/McWilliams team. With about 7 minutes to go in the 4th, it’s when Senior leader Kyle Holcomb decided he wasn’t playing his last URA game in this night. Holcomb erupted for 15 points in the 4th quarter, practically strapping the team to his back. Jackson Shafer hit a clutch 3 pointer to turn the tide and send Matson/McWilliams back to the soccer fields. Holcomb finished with 20 points in the win while Steven Fatzinger had 14 points and Joe Dougherty 12 in the loss.